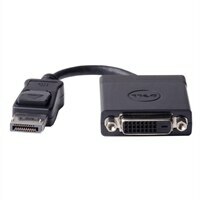 Dell Adapter - DisplayPort to DVI Single-LinkThe Dell™ DisplayPort to DVI (Single-Link) adapter lets you to take video content from your laptop or desktop and display it on any monitor, projector or HDTV featuring a DVI (Single-Link) input. This user-friendly adapter supports a maximum video resolution of 1920 x 1200 and ensures a quality viewing experience. The adapter can be used to enjoy movies on a home projector, mirror your desktop for an expanded workstation or show presentations at school or work. The Dell™ DisplayPort to DVI (Single-Link) adapter lets you to take video content from your laptop or desktop and display it on any monitor, projector or HDTV featuring a DVI (Single-Link) input. This user-friendly adapter supports a maximum video resolution of 1920 x 1200 and ensures a quality viewing experience. The adapter can be used to enjoy movies on a home projector, mirror your desktop for an expanded workstation or show presentations at school or work.